Chevrolet's and GMC's product plans include a revamped car lineup, the launch of a long-range electric vehicle, a pair of new crossovers and refreshed full-size pickups. Click here to download a PDF timeline of GM's product plans. Spark: A lower, longer version of the Chevrolet minicar is scheduled to arrive in the fourth quarter for the 2016 model year with a new, more powerful 1.4-liter engine. It's unclear whether the Spark EV -- now sold in just three U.S. markets -- will remain after the arrival of the Bolt EV by early 2017. Sonic: It appears GM recently pushed back the planned redesign of the subcompact Sonic, which likely won't appear until 2019 at the earliest. Sales of the Sonic, which debuted in 2011, have slowed recently along with those of other small cars amid lower gasoline prices. A face lift and interior improvements are possible, likely around 2017. 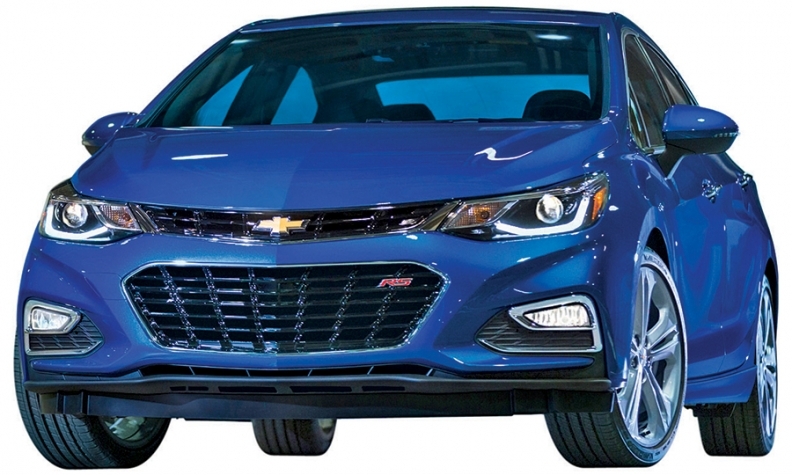 Cruze: Production on the next generation of GM's top-selling global car should start by late February, with the vehicles arriving in showrooms sometime in the spring. It's longer and more fuel-efficient, with a new turbocharged 1.4-liter, four-cylinder engine. A 1.6-liter diesel is planned, by late 2016 or early 2017. A hatchback model is also in the works, with production slated to begin in Mexico by fall 2016. Expect Chevy eventually to add a performance model or two off the hatch variant to rival the Ford Focus RS and other new hot hatches. 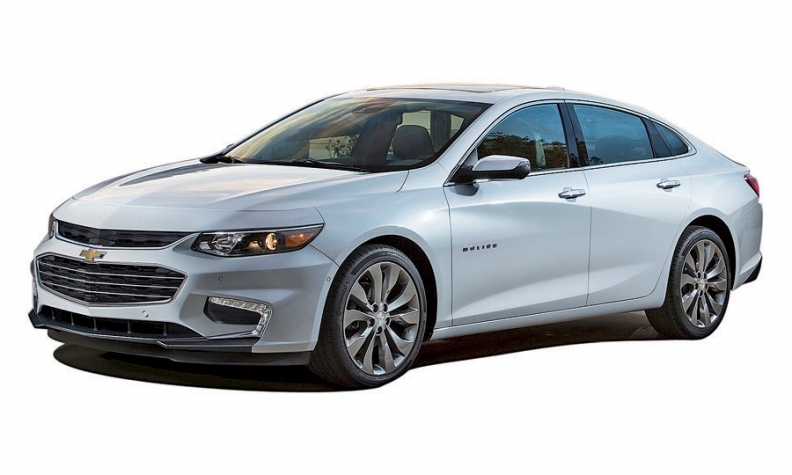 Malibu: Production is slated to begin in October for the redesigned 2016 Malibu, which is built on a longer wheelbase than its predecessor for a roomier rear seat. A hybrid version is set to arrive in spring of 2016 with the promise of a combined average fuel economy of 47 mpg in city and highway driving. Impala: The big sedan is slated for a re-engineering in the second half of 2016 for the 2017 model year, which likely would include cosmetic and interior updates and the addition of a nine-speed automatic transmission. A redesign isn't planned before 2020. Production of the Impala Limited -- the predecessor to the current sedan that is now sold only to fleet customers -- should continue until 2016, possibly spilling into 2017. Chevrolet SS: The large, rear-wheel-drive performance sedan is expected to be phased out sometime in 2017, when GM shuts its Australia manufacturing operations. 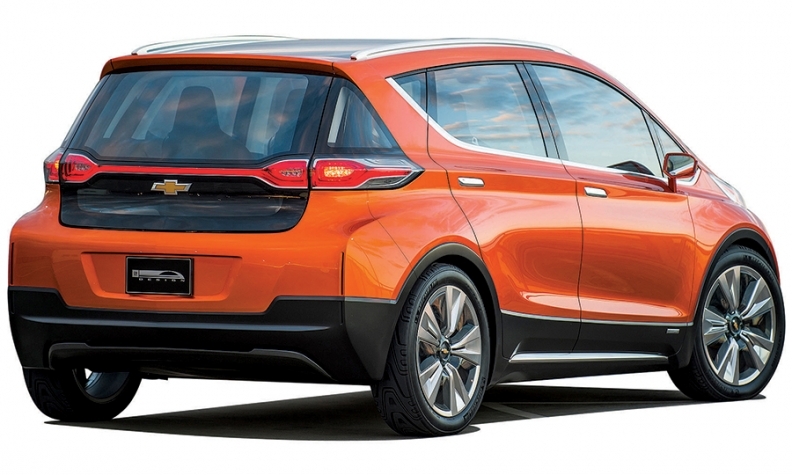 The Chevy Bolt's range will be 200 miles, GM says. Bolt: GM recently moved up its production target for the EV, to the fourth quarter of 2016. GM has said the 2017 Bolt will go 200 miles on a single charge and be priced at around $30,000 after federal tax credits. Volt: Production is set to begin this fall on the second generation of the plug-in hybrid, which GM says will travel about 50 miles on a single charge. Camaro: GM is expected to begin production in October of the sixth-generation Camaro, which has been moved from Canada to a plant in Lansing, Mich. The coupe's engine lineup will range from the base 2.0-liter, four-cylinder turbo to a 6.2-liter V-8. Production of a droptop starts in early 2016. Higher-end models should follow after the 2016 model year, including the likely addition of a Z/28. Corvette: Multiple reports in Car and Driver over the last year have fueled fanboy chatter -- yet again -- about a forthcoming midengine 'Vette. While there is reason to believe that the decades-old rumor might have some merit this time, the magazine's prediction of a 2017 model is dubious. A better bet is a refresh of the current Stingray for the 2017 or 2018 model year, with the next generation -- midengine or not -- coming closer to 2020. Trax: While the U.S. version is less than one year old, the subcompact crossover's styling dates back three years to its overseas launch. Chevy is likely to revise the front fascia for the 2017 model year to bring its face in line with the rest of the portfolio. Expect a redesign by early 2019. Small GMC crossover? : GM officials have said they're looking at a GMC crossover in the same petite package as the Chevy Trax and Buick Encore, which both are based on GM's global subcompact architecture. Some industry insiders say such a vehicle has been greenlighted; others say nothing has been confirmed. This spring, GM filed to trademark the name "Granite," which was the name given to a small GMC crossover concept that GM showed at the 2010 Detroit auto show. Stay tuned. Equinox/Terrain: The long-awaited redesign of GM's popular crossovers is slated to begin production in early 2017, as a 2017 or 2018 model. The vehicles will shrink a bit as they move to GM's global compact platform, which also underpins several high-volume cars, including the Chevy Cruze and Buick Verano. A strong possibility for the base engine is the 1.5-liter, four-cylinder turbo that will serve as the base powerplant in the '16 Malibu. Other engine prospects include a 2.0-liter turbo -- also to be offered on the Malibu -- and a naturally aspirated, 2.5-liter four-cylinder. A hybrid model could be added as well. The optional 3.6-liter V-6 will be dropped and is unlikely to be replaced by any six-banger. Midsize crossover: The downsizing of the Equinox creates space in Chevy's showroom for a new midsize crossover, which will fit between the Equinox and the full-size Traverse. The crossover will line up against the Ford Edge, Hyundai Santa Fe Sport and Nissan Murano. It's unclear what Chevy will name the vehicle, which is targeted for an on-sale date in the second half of 2017. It is based on the same platform as the 2016 Cadillac XT5 (former SRX) and the next generation of the GMC Acadia, which will shrink in size from the current one. Acadia: Production of the smaller Acadia is set for mid-2016 at GM's Spring Hill, Tenn., plant, replacing its decade-old predecessor. It will continue to feature a third row despite the downsizing. Engine possibilities include a 2.0-liter, four-cylinder turbo and a clean-sheet redesign of the 3.6-liter V-6 used in today's Acadia. The older version, built at a GM plant in Lansing, Mich., could stay in production for several months following the arrival of the redesign. Traverse: The second generation of Chevy's large crossover is scheduled for a mid-2017 on-sale date, as a 2018 model. The base engine is likely to be a new 3.6-liter V-6, a more powerful and fuel-efficient version of its current engine. Tahoe/Suburban/ Yukon/ Yukon XL: GM's eight- and 10-speed transmissions are likely to migrate across the lineups of the big SUVs over the next two years. Refreshes are likely in 2017 for the 2018 model year. A move to a new truck platform is likely in 2019, after the rollout of GM's next-generation Silverado and Sierra. Colorado/Canyon: Models of the midsize pickups equipped with a 2.8-liter, Duramax four-cylinder turbodiesel are scheduled to arrive in showrooms this fall. The addition of an off-road ZR2 model is a good bet, possibly as a 2017 model. Silverado 1500/Sierra 1500: A face lift of GM's highest-volume U.S. vehicle line is slated to arrive in the fourth quarter for the 2016 model year, an effort to energize the trucks' exterior styling. In 2017, GM is expected to add the 10-speed, rwd transmission that it has been co-developing with Ford across some of its pickup portfolio. The pickups are scheduled to move to a new platform in late 2018 or early 2019. GM is expected to use aluminum for the hood, doors and liftgate to cut weight, but it likely will not go as far as Ford, which also uses the lighter-weight material for the bed of the F-150. GM is considering use of an air suspension system, similar to the one used in the Ram pickup, sources have said. Silverado 2500/Sierra 2500: Recent spy shots showed refreshed exteriors of the heavy-duty pickups, with restyled grilles and revamped hoods. Those are likely to appear in 2016. The trucks should move to a redesigned platform within a year of the light-duty counterparts, sometime in 2019. City Express: Chevy launched the small van in November. It is a rebadged version of Nissan's NV200. Express/Savana: GM remains the only major player in the fleet space that has not replaced its aging full-size cargo van with a more-efficient, European-derived model. There doesn't appear to be any near-term change to the plan.